A new improved Olive S Serum has two new ingredients added. This highly increases the benefits of this beautiful skin nourishing oil. First a little bit of chemistry to briefly explain the role of free radicals and anti-oxidants and why anti-oxidants are an important part of skin care. · Free radicals are unstable and to address this instability they steal tiny parts from the nearest stable molecule. The attacked molecule then becomes unstable as it loses an electron and in turn becomes a free radical. When anti-oxidants are unavailable, there is increased instability and cells dehydrate, collagen loses its elasticity and the damage accumulates with age. The results are visible signs of ageing. 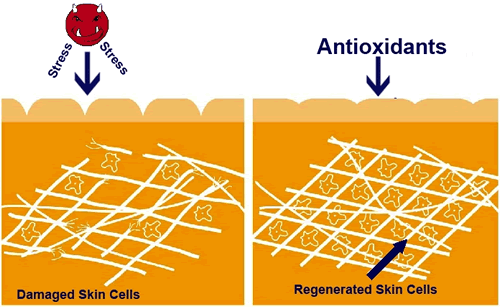 Anti-oxidants protect cells from the destructive effects of free radicals; they neutralize them by donating one of their own electrons to stop the ‘stealing’ effect. By donating a small part, anti-oxidants prevent cell and tissue damage. Antioxidants do not become free radicals, as they are stable in either form. Olive Squalane is literally a ‘skin food’ as it actively revitalises the skin well into the different layers. It has many beneficial properties some of which are mentioned at the start of this article, it also reduces skin redness and irritation. CoEnzyme Q10 is an anti-oxidant that is naturally found in living cells in the body and as we age, the production of it slows dramatically. Adding it to a moisturizer, it fights off the damaging effects of free radicals and maintains the beautiful, youthful radiance of your skin and softens existing wrinkles and age spots. Vitamin E is the most abundant and efficient fat-soluble antioxidant found in the body. It is an excellent moisturizing and hydrating agent that penetrates the deeper skin layers and binds water in the skin. Vitamin A is an active agent and promotes enzyme activity in the treatment of ageing skin. It thickens the epidermis and can regenerate skin prematurely aged by UV-radiation. It also helps increase the skin’s elasticity. Both Lavender and Helichrysum are skin healing oils; they promote cellular growth and repair damaged skin. This beautiful blend is quickly absorbed by the skin and leaves it feeling nourished and smooth.